Parrot's second offering in the space features a lightweight design intended for safe flying indoors or outside, although if you're just starting out we recommend giving it a whirl outdoors on a clear day. The drone features a 14 megapixel full HD camera that can take photos or video in 1080p and its own Wi-Fi hotspot from which you can control its flight path using Parrot's FreeFlight 3 app, available for free in Apple's app store. As can be expected of an entry-level drone, setup is a fairly straightforward process. Preflight consists of charging one of the two included replaceable batteries, popping it into the drone and connecting your smartphone via Freeflight 3 app. Switching Bebop on automatically activates the drone's onboard Wi-Fi module. After a quick calibration sequence, you're ready to take control of the device's flight pattern using the app. Along with a virtual control pad, the in-app dashboard view features gauges for speed and altitude levels, as well as dedicated buttons for take-off and landing procedures. 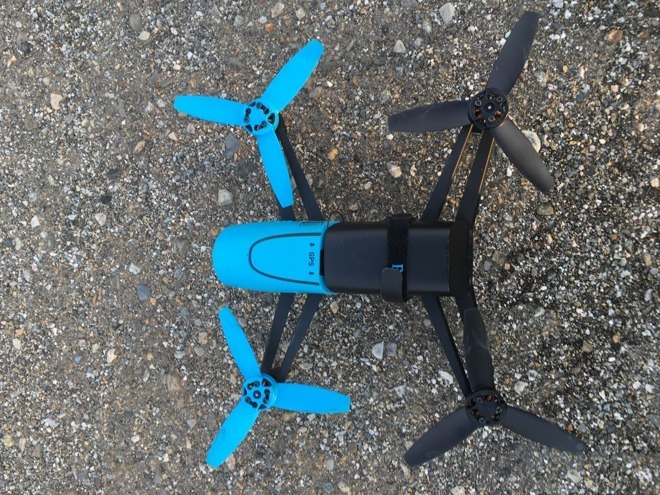 Thanks to an embedded GNSS-type GPS chip, 3-axis accelerometer, gyroscope, magnetometer, ultrasound sensor, pressure sensor and a downward-facing camera, Bebop is incredibly stable in flight. The robust sensor suite feeds raw data to a flight control system that keeps tabs on in-air vitals, leaving users to focus on flying. 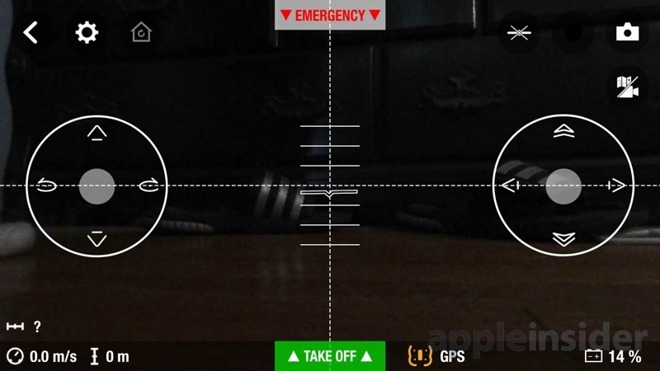 Beyond basic directional controls and camera pan system —both operated by onscreen joysticks overlaid atop a livestream from the drone's camera —the app offers a myriad of more advanced settings (accessible in the app's settings menu) to assist in safer flying of the device. These include the ability to set a max altitude, which limits how far the device can fly, a distance limiter which determines how far the device can fly relative to you and a "return home" feature which, if activated, will guide the drone back to its original take-off location. Like other drone manufacturers, Parrot includes a fail safe emergency sequence that lands the quadcopter quickly and safely. The company even has preset flight plans available as an in-app purchase that allow users to plan out a designated route on a map. The option is a good way to get a feel for the device if you're a little skittish about flying it solo. Rest assured, you can always take back control of the device in the middle of a flight plan, if need be. 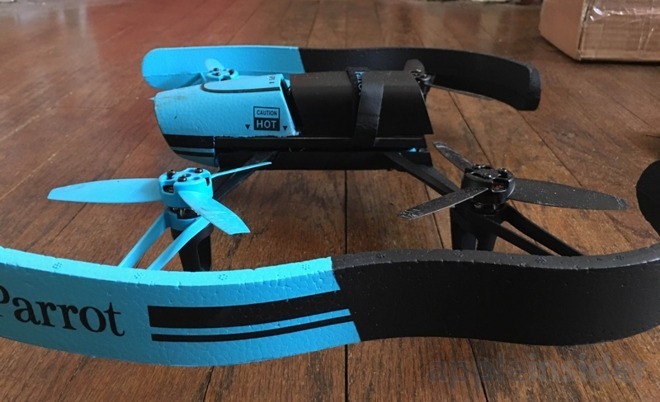 The device also comes with an attachable hull which gives the drone an additional layer of protection if you're flying indoors, although it's recommended that you operate the drone without the hull while piloting the device outdoors, since the added material makes the drone more susceptible to wind gusts. Generally speaking we found Bebop to perform admirably and in respect to its advertised features. However, the lightweight design, while easy to store and tote around, also makes it fairly susceptible to wind when flying outside, with or without the hull attached. There were a number of instances when the device seemed to lose control with even slight gusts of wind. 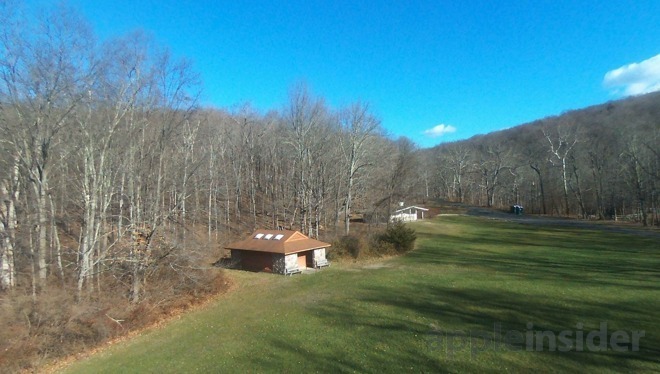 If you're just starting out, it's good practice to operate the drone in a wide open space, free from trees and other potential obstructions. Additionally, we found the battery life was somewhat shorter than advertised, usually coming in slightly less than 11 minutes. Power consumption varies depending on how heavily the onboard camera is used to snap photos or record video. Luckily, the drone comes with two rechargeable batteries that can be swapped out when necessary. At the same time, we found the camera itself takes remarkably clear pictures and video while the device is airborne. Wide-angle images and videos at 4096 x 3072 pixels can be easily transferred from the app to your iPhone's camera, then on to friends or the Web. Bebop also sports one-touch uploading for those with YouTube channels. 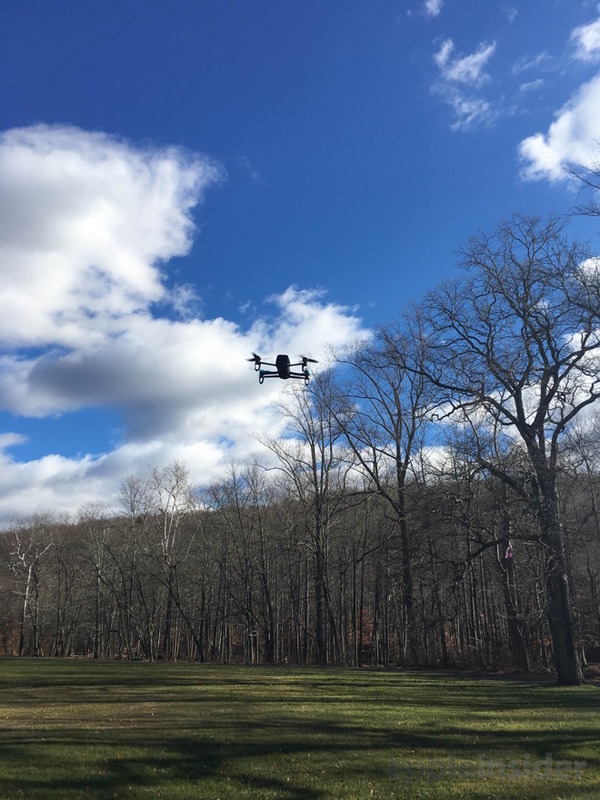 Overall, we felt the drone was good enough for hobbyists, particularly those who have flown drones before and don't want to spend upwards of $1,000 on a high-powered but pricey model. 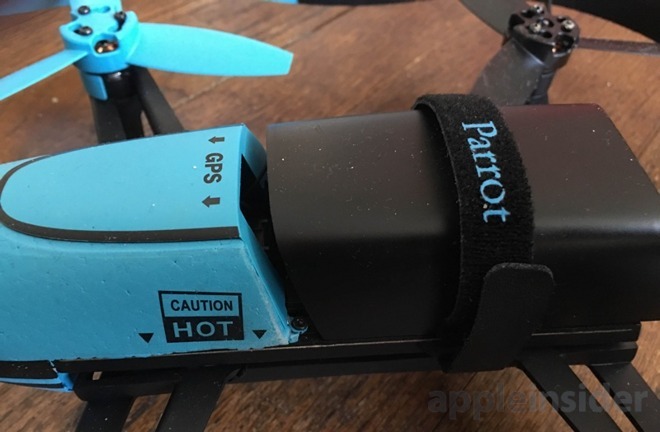 The level of technology Parrot managed to cram into Bebop is admirable, and the sensor suite is especially impressive for the low-end price range. However, for those who are still very new to the world of drones (the author of this post included), it might be a better bet to go for something smaller and perhaps easier to fly, like BLADE's Nano QX RTF Quadcopter. While it doesn't feature a camera, this "micro drone" is also small enough to be flown indoors and features stability and agility control which should prevent the device from getting away from newbies who are just learning to fly and don't want to break anything in near proximity. Easily susceptible to wind when flying outdoors. Not for beginners. The Parrot Bebop Drone comes is available in red, blue and yellow for $349.99 from Amazon.com.